Abstract: By referring to the stimulation theory, the authors studied the theoretical foundation, specific methods, implementation standards, implementation procedures and subject responsibilities with respect to financial subsidies for the public welfare opening of public sports venues in Guangzhou. From the perspective of implementation ef-fect, financial subsidy measures effectively improved the service efficiency of the public welfare opening of public sports venues in Guangzhou, and are in conformity with the national policy development direction. 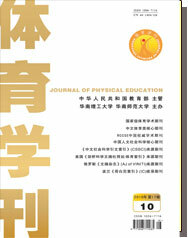 The authors concluded that the successfully experience of financial subsidy measures for the public welfare opening of public sports venues in Guangzhou include such 4 aspects as completing policy assurance for financial subsidies for the public welfare opening of sports venues, establishing a unified financial subsidy management system and evaluation standards, doing a good job in financial subsidy supervision management and standardized guidance, and gradually perfecting and innovating on financial subsidy measures.